With Mi A1, Xiaomi took the uncharted (for itself) route of using vanilla Android and launching it as the company’s first Android One smartphone. One of the perks of bearing stock Android included an early access to Android Oreo beta which began rolling out to owners in the second week of December 2017. Now, Xiaomi has fulfilled its promise of bringing a stable version of Android Oreo for Xiaomi Mi A1 within 2017, releasing the update in time for users to bid farewell to the passing year. 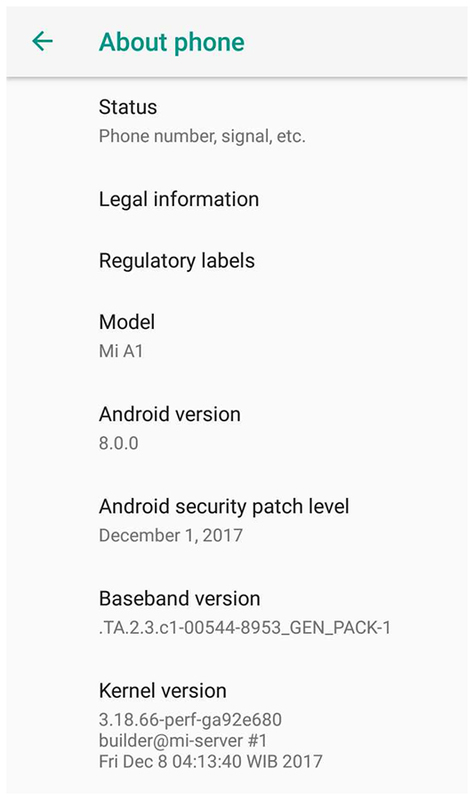 The Mi A1 Oreo update will roll out to users in batches, on a pre-condition that their devices are already running the recent stable update i.e. version 7.12.19. The update begs 1,107MB of download and brings standard Android Oreo functionality including adaptive icons with notification dots, picture-in-picture mode, contextual text selection, redesigned emoji (excluding the fixed hamburger), and improved notifications. Apart from the common Oreo features, the update also brings fast charging via Qualcomm’s Quick Charge 3.0 technology, although the charger bundled with the Mi A1 has no support for it. The feature, which was introduced in Android Oreo beta was tested by an MIUI forum member using OnePlus’ Dash Charger. The update jacks up the security equation with the Google security patch of December 1, 2017. A handful of beta testers, however, were irked by this as the experimental update brought January’s security patch to Mi A1. This update helps Mi A1 take the lead as one of the early mid-range devices to get stable Android Oreo. The company has, however, not kept its promise of releasing kernel sources, and this step cripples the enthusiasm of the aftermarket ROM developers community. Recently, the device also got a permanent price cut of ₹1,000 in India that makes it a very attractive choice in the segment of budget-friendly devices. Don’t worry if you haven’t received the update yet, as this is a batch-wise rollout. If, however, you cannot wait, head over to the tutorial on MIUI Forums to manually upgrade to the latest version of Android for Mi A1.